How to draw portrait of Gwen Stacy from Spiderman. Gwen Stacy is not affiliated with any team, but was the love interest of Peter Parker for some time. In this tutorial, you will learn to draw Gwen Stacy in semi-realistic portrait style. A portrait is a painting, drawing, sculpture, or other artistic representation of a person, in which the face and its expression is predominant. The intent is to display the likeness, personality, and even the mood of the person. In this drawing, I will demo a portrait drawing step by step in front view. It is very difficult to get the likeness in portrait. The technique is to place the eyes, nose, lips, all the elements on the face in the correct places. Also the shape, size and distance of each element has to be accurate. If you can accomplish these task, you will achieve the likeness. The best way to get good a portrait is through careful observation, measure, and practice. This video will explain the technique I usually do on portrait drawing and some thought behind it. It is not a demo of drawing Gwen Stacy though. But you will get the idea. 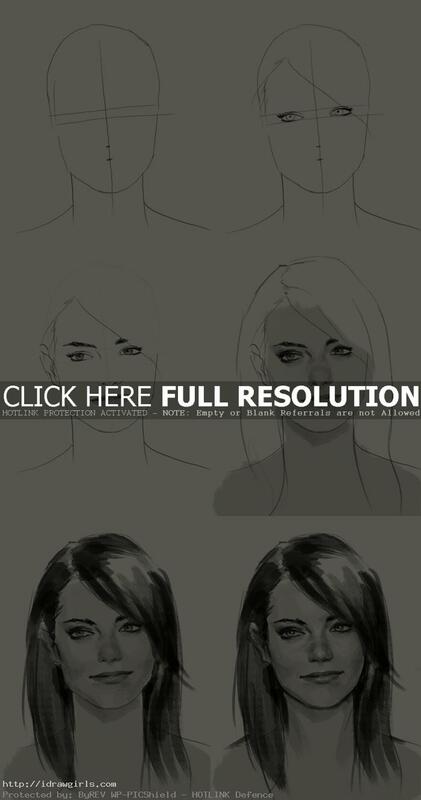 Below are step by step how to draw Gwen Stacy. Step one, I drew three lines and two dots the measure and line up her facial elements. Step two, I drew her eyes inside the paralleled lines. Step three, I drew her eyebrows, nose, and lips with some hair. Step four, I shade in her skin tone so that I can get the light and dark value on the portrait. Step five, I shade her hair then add some darker shade to the side of her face. Step six, I look at over all detail and finish the portrait. Photoshop but I could do the same with pencil and charcoal. Tools are just tool, knowing where to shade is the key to your painting. If you never use Photoshop or any painting tool. I suggest start getting good with value using pencil or charcoal first. Then you will get there. Look under FACE or ARTTips under the head title and you will find something. You are looking at the solution the wrong way. It isn’t the brushes, it’s edges and how they interact with other values or background. Just a little question, do you have a tutorial on how to use texture brushes right for painting humans? That looks Emma Stone to me.